The Château d’Etoges was built in the early 1600s by the Counts of Anglure on the foundations of a 12th-century fortress. The kings of France used the château as a base while traveling between Paris and Strasbourg, in the eastern region the empire. Louis XIV, the Sun King, expressed his delight with the fountains in the small lakes on the grounds. Louis XVI did not have so happy a stay at the château; at the time the French Revolution in 1791, he sought temporary refuge here during his flight to Varennes. After the Revolution the château passed to wife of Marshall Lanne. She played hostess to a stay by Napoleon and his entourage. The château opened as a hotel in 1991. For those who find stairs challenging, you might opt for a room in the Orangerie where there is an elevator. Also, the rooms in the Orangerie are a bit more up to date and have air conditioning. Within the château, you’ll find a huge differences in style and decor. It might be wise to spend a little more and not be disappointed. Etoges is located 22 km. south of Epernay, where D189 and D933 meet. Nearest train station is at Epernay. Ideally situated with easy driving of many of the region’s famous champagne caves, the Château d’Etoges offers pastoral accommodations where the only sounds likely to disturb you are the outside fountains and the occasional rooster. 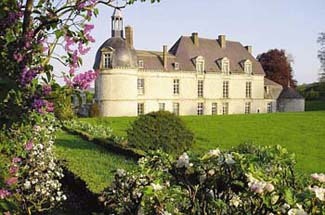 The château is for those guests who love loads of atmosphere and character. You can enjoy a fireplace in the lounge when the weather is chilly or a glass of champagne outside in the gardens when the sun is shining. Guest rooms come in all shapes and sizes. The hotel classifies them as “classic, superior, and privilege.” Try the “Astree” room on the second floor, which features a big stone fireplace, high ceilings, and furniture to suggest the 17th century. Other rooms can be small with quirky configurations. Just 50 meters away, you’ll find updated rooms in the Orangerie. Through the windows you’ll see lovely gardens and woods—spread over 18 acres—that invite you to explore. For fun, you can row a small boat around the surrounding moat. Well-reviewed dining is found in the Orangerie building, while breakfast—served buffet style—is in the château’s salon.